11 Of whom we have many things to say, and hard to be uttered, seeing you are dull of hearing. 12 For when for the time you ought to be teachers, you have need that one teach you again which be the first principles of the oracles of God; and are become such as have need of milk, and not of strong meat. 13 For every one that uses milk is unskillful in the word of righteousness: for he is a babe. 14 But strong meat belongs to them that are of full age, even those who by reason of use have their senses exercised to discern both good and evil. The whole tenor of this passage is “you ain’t where you should be in your life.” Do you think that this could be said of you, or me, or the church in general? I certainly do. So, let’s look at what the writer is trying to communicate through this section. For this, he chided his readers, and declared that these, who should be mature, are yet quite immature. Can you say, “40 years old and still in diapers?” Humiliating. Becoming “dull of hearing” (v. 11) seems to be a dangerous place at which to arrive. It means you can’t understand. It means you prefer to hear only that which you already know and agree with, thereby stunting your growth. He goes on to tell us how to avoid such a condition a little later on. 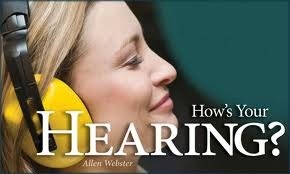 Dullness of hearing comes from a failure to practice what we know in at least two specific ways: doing and listening. Jesus said that we are to pay attention to what we hear and the manner in which we hear it (Mark 4:24). Too often, I find that most conversations are fueled by “I can’t wait until you take your next breath so I can talk.” That is hardly listening. This is NOT a “three-step program,” but a simple one-step that yields amazing benefits. Would you not agree that only having to remember one step is a whole sight easier than trying to recall three? Just simply practice listening. The rest will take of itself. However, without this practice of Jesus’ and James’ teaching, we will, unfortunately, become dull of hearing. It’s a “use-it-or-lose-it” type strategy. Until the next time, will you commit yourself to practicing listening? If you are a ‘talker.’ Then this will prove no small task for you. Your jaw will begin to hurt if you are really working at it. Let the rest of us know how you’re doing with this practice.